We have all heard all of the buzz circulating about this year's Presidential election. That's too much adulting for some of us. 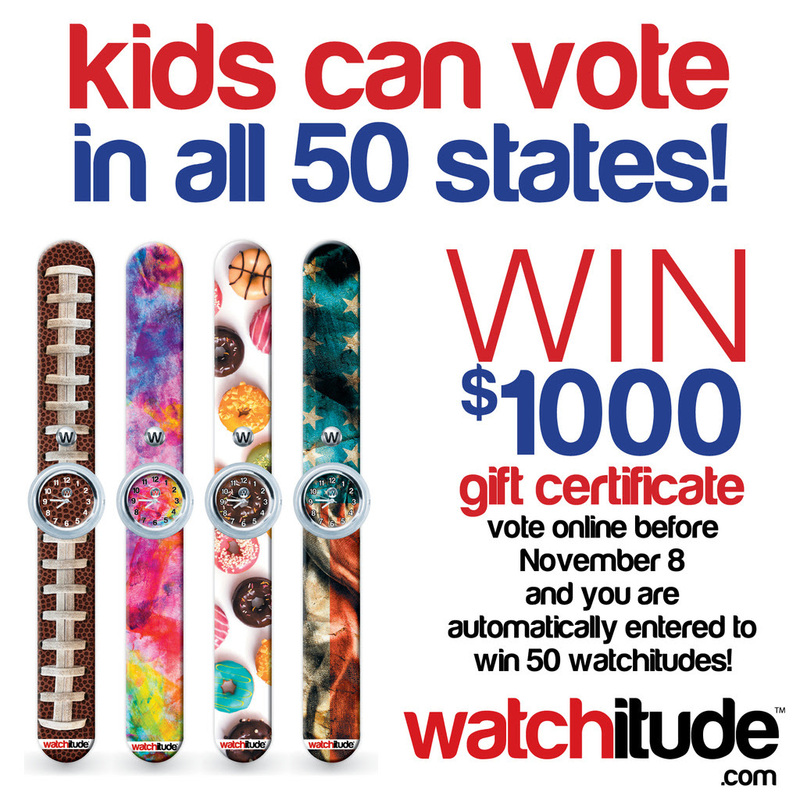 While kids aren't quite old enough to cast their votes in the Presidential election, there is no reason to feel left out of all of the voting fun when they can vote in Watchitude’s Design Contest! Thank you to the team from Watchitude for providing this informative content and a promotional item for the purpose of facilitating this advertorial content. Creative, talented individuals, just like you and me, were given the opportunity to create and upload images of their unique designs to qualify for the chance to win a free Watchitude brand watch. The Watchitude creative team has been hard at work, carefully reviewing hundreds of entries. Their top picks are showcased on the Watchitude VOTE page, and now it's time for you to choose the official winner! Take a look at the over 120 featured designs to choose from, have your voice heard by voting for your favorite design on Watchitude’s website. Now is the time for kids from all 50 states (including Canada, Europe and Asia) to vote in the contest. 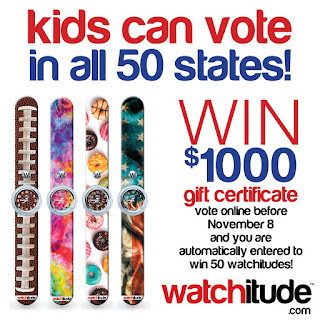 To be eligible to vote, kids must enter an email address, once entered, all kids are automatically eligible to win a $1,000 Watchitude gift certificate. Imagine being able to have 50 Watchitudes for free! The winning Watchitudes designs (up to 10) will be taken from paper and put into production with the designer’s name proudly displayed on the back of the box packaging. Each of the chosen designers will also receive a free Watchitude with their design as a congratulatory prize. Hurry! The deadline to cast your vote is by midnight on Election Day November 8, 2016. The latest in accessory trends, Watchitude specializes in funky, fun and unique slap on wrist watches that feature an array of designs such as frosted donuts and pepperoni pizzas to animal prints and cityscapes. Watchitude is an affordable way to decorate your wrist and elevate your arm candy and with about 100 quirky designs to choose from, you’ll have no problem finding one that displays your personal style and mood.